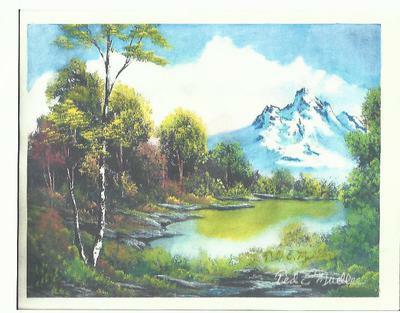 Addison library has invited Ted E. Mueller to have a one person exhibit of his original paintings during the entire month of January, 2014. Soon to be shown on Art In "Tropical Australia" is Ted's paintings of his "Peaceful Splendor - Series 2", the 27 latest paintings he has created during year 2013. Ted is searching for titles for each painting. This is a new endeavor of mixed media, acrylic and water color on water color papers. This style is unique. So real as someone noted, looks like a photograph. I sat and stared at this painting for the longest time. Then I closed my eyes and walked around this beautiful picture. And when I was finished with my imaginary walk,I headed for my recliner chair, and I was not even tired from my walk. I endorse this method as healthful way to walk and get exercise. What beautiful pictures. Very bright colors and nice lines. I really like this style of painting. Thank you so much for such an interesting post! I must admit Ted E. Mueller has become my favourite painter! If the picture shown here is anything like what is to come, I can only say WOW. I've seen his paintings on this WEB page. This man has a photographic method of his paintings. Such detail and precision. The realism he has is so (I don't know how to describe) amazing. Click here to return to Art Events.